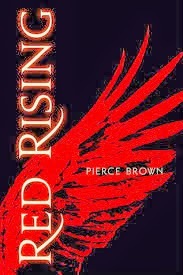 I received a copy of Red Rising from Net Galley in exchange for an honest review. If you like a story with loads of action, then this is your book. Once it gets going, Red Rising is a nonstop thrill ride of events, dialogue, and twists and turns. There is very little sitting still happening in this story line. Promised as a mash up of Ender’s Game and The Hunger Games, Red Rising lives up to that challenge in its world building. Set on Mars and full of futuristic elements, it lives up to its billing by setting up a complete society with plenty of cruelty and repression for the folks born into the Reds. The ruling Golds become a perfect example of villains. I should warn that there is a lot of violence in this book and it might not be a good fit for younger readers. Animals are killed in large numbers as well as human beings. The main character, Darrow, often seems to favor violence purely for the sake of violence. There is little lightening of the killing with regret for its necessity. The writing is done in a minimalistic style. Descriptions of settings and characters are done in a few bold strokes. For the settings, that was more than enough to ground me in the action. The limited description let my imagination take control of picturing the world and that worked well for me. However, I was a little disappointed with the characters. The lack of characterization kept me from rating this book five stars. I didn’t feel that I got close enough to the characters to care deeply whether they lived or died. The sheer numbers of this large cast and the brevity of the writing kept me from getting as close to the characters as I usually preferred. The driving force behind Darrow is the loss of his wife, yet I never developed sympathy for her. Though I tried to get attached to her and Darrow, I couldn’t lose myself in his cause. I did come to have respect for Darrow as he turned the corner and found enlightenment and purpose in his own journey. Red Rising deserves four stars for its very cool futuristic concepts and gripping action.